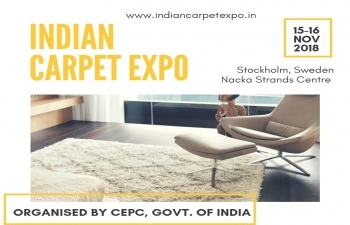 "Carpet Export Promotion Council is organizing an exclusive exhibition of Indian Handmade Carpets at Nacka Strands Centre, Nacka Strands, Stockholm, Swedenfrom 15th to 16th November 2018. This Expo will have Exhibitors from all the carpet manufacturing regions of India. It is a splendid opportunity to meet all important people of Indian Carpet Industry under one roof. All Interested Peoples from Sweden are most welcome." Buyer Seller Meet in Stockholm more details can be obtained from the attached flyer.